If you have any experience of young children you will know that they love to lick things. And when I say ‘things’ I don’t mean ice lollies or candy canes. That would be far too sensible. I’m talking about the bottom of dirty shoes, the door handle to the grocery store bathrooms, or the pre-chewed gum stuck to the playground rubbish bin. My children are no exception. That is why I spend most of the winter months trying to find excellent sources of probiotics to repopulate my family’s recently emptied guts with good bacteria. 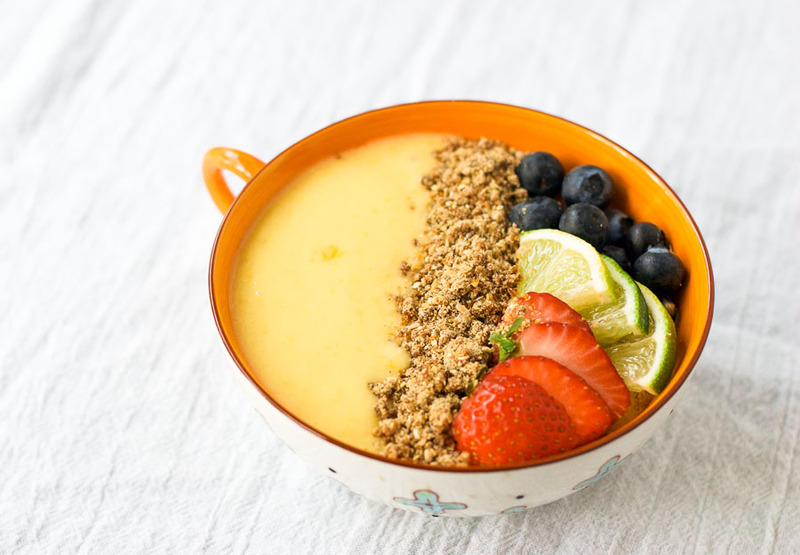 And that is where this mango lime smoothie bowl comes in. Good intestinal health is vital for a strong immune system. In fact, 70% of our immune system is located in our gut. The microbes in our large intestine carry out many crucial jobs, including fermenting the fiber we eat to produce helpful acids, producing Vitamin K, and keeping bad bacteria in check. That is why it is so important to keep your gut nicely populated with good bacteria. You might be wondering what this has to do with a delicious mango lime smoothie bowl. Well, the answer is… kefir. Kefir is a fermented milk drink made with a yeast and bacterial starter called kefir ‘grains’. Several of the bacterial strains found in kefir have excellent probiotic properties. Probiotics are live microorganisms that bring about a response in the gut that is associated with health benefits. Kefir is an excellent source of these healthy microorganisms. Just make sure you buy the unsweetened version, otherwise there will be lots of added sugar. And an added bonus of kefir is that it is far more tolerable for people who are lactose intolerant because most of the lactose is broken down during the fermentation process. 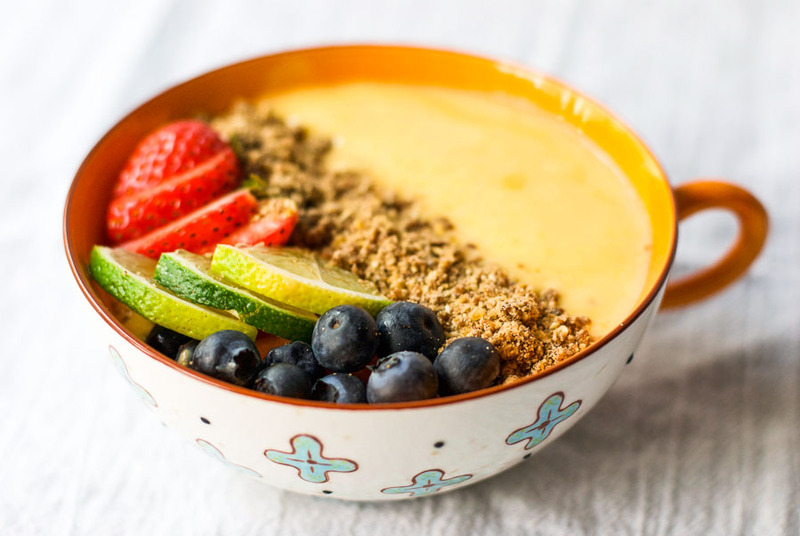 I topped this smoothie bowl with Jamie Oliver’s amazing granola dust. It is a wonderfully healthy and versatile recipe featured in his new book, Everyday Super Food. You can find out how to make it by watching his video here. 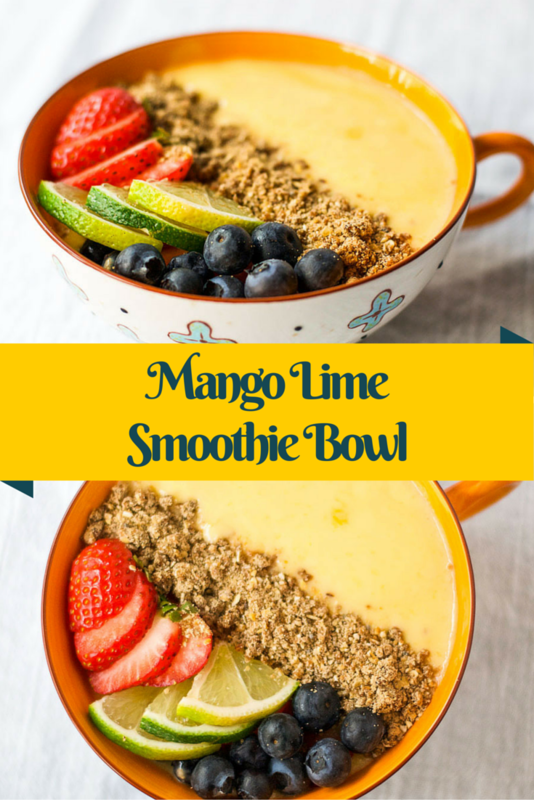 Put mango, kefir, lime juice, and honey in a blender and blend until smooth. Top with granola dust and fruit. 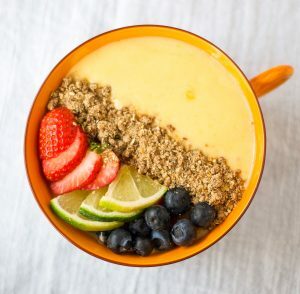 Very healthy and tasty bowl! This looks fantastic. I am a big fan of kefir and drink it quite a lot to repair years of damage to my digestive system from too many night shifts, but I have never thought of mixing it with anything – I bet the taste works really well with mango. Hi Dawn. Thank you for your comment. Kefir is a great base for any smoothie. It makes them really creamy. You just need some sweet fruit to counteract the tart taste. How far in advance can these be made? I like to make a lot of my food for the busy work week on Sunday. How far would these last? Hi Jessie. That’s great that you make food in advance. Such a fantastic way to make sure you eat good food on days when you’re busy. The only problem with making smoothies in advance is that they lose some of their nutrients and they don’t keep too well after about 12 hours maximum. You could make this smoothie in the morning and keep it in the fridge until later that same day, but I would not keep it overnight. Hope that helps. I just came across your site, and I wish you well on your new endeavor! I also hope you can come up with some different recipes as every site has the same ol’ same ol’. It would be very nice if you included nutritional information with your recipes as this can be quite important for some of your readers. Hi Jane. Thank you for your great constructive criticism. I love it when readers let me know what they want. I will try to come up with some different recipes. What I try to do is take common recipes and tweak them to make them healthier, while still maintaining their yumminess. I will definitely start adding more nutritional information. I agree that it is important. Thank you. I don’t know if it was the kefir or something else, but I really was impressed with how smooth the smoothie is — and its taste is out of this world. What a bonus that it is healthy too! What a great recipe! I had forgotten that lime and mango are such a winning combination. It is just the right amount of sweet with a refreshing kick from the lime juice. I also like your kefir addition. My kefir journey became even more exciting recently after I found goat kefir at Wholefoods Market. It was affordable too. I don’t use dairy from cows so this was a lovely find. Please keep up the good work. Its lovely to have your ideas and the photos are beautiful!